Segey and Alyona from Bobruisk can finally hope of a better life, thanks to the support of our project’s regional family support coordinator. Segey and Alyona live in the small town of Bobruisk, Belarus. Their son has a life-limiting medical condition, and for years both parents had to spend extended time with him in hospitals. During this period, they were forced to leave their older daughter in the care of grandparents in another town over two hours away. “We saw our daughter once every three months in between hospital stays”, remembers Alyona. When their son’s condition became more stable, the family was able to be reunited. However, their living conditions in a family hostel were not suitable for a disabled child— their room was on the fifth floor without a lift. The family was forced to find expensive rented accommodation in a run-down building, putting them in serious financial hardship. Alyona describes this as a very difficult time for her family: “I look after our son, while my husband works. Most of his salary is spent on our rent.” The family remained on the waiting list to receive subsidised social housing for three years: “when we first joined, we were number 1,500 on the waiting list” recalls Alyona. “We hope for a better life and dream to move to our new house”. She adds: “But this is all thanks to Anastasia. She gives us energy and motivation. We didn’t know about the benefits that we were entitled to”. This situation could have continued for many more years, had it not been for the support of our project’s regional family support coordinator, Anastasia. Anastasia liaised with the town administration office to explain the family’s situation and to advocate on their behalf. 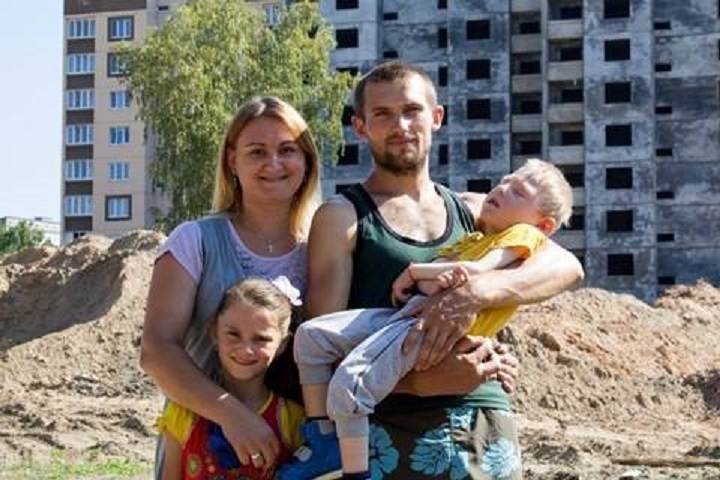 Within three weeks the family received a letter explaining that they were entitled to receive a discounted mortgage and subsidy in a new block of flats that was being constructed in Bobruisk. “Our current rent is twice the cost of the mortgage payment, plus we got a very good subsidy which covers one third of the total cost of the new flat.” Alyona explained happily. “We hope for a better life and dream to move to our new house”. She adds: “But this is all thanks to Anastasia. She gives us energy and motivation. We didn’t know about the benefits that we were entitled to”. The family is pictured in front of the new block of flats which will be completed in the spring.